Well, not exactly a collision but a conjunction, meaning that the three planets occupy the same section of the night sky, in the constellation of Leo. These planets coming together in Leo speak about courage, creativity, drama, recognition and pride, as well what we hold dearest in our hearts and in our minds. Coming straight of the back of the Aquarius Full Moon adds to the drama and intensity of this triple conjunction and Mercury retrograde urges us to review our ideals. Are we idealistically clinging on to old, worn out mindsets? When we relate to others are we truly sharing, giving of ourselves, or are we only thinking of what we can get out of the partnership? Are we channeling our creative energies in the right direction? Where in our lives do we truly need to be courageous now? Do we unrealistically expect our relationships to be perfect? Giving some thought to these questions now, could help us when sensitive, self-protective Mars in Cancer squares up to stern, relationship focused Saturn in Libra on the 25th. This is a less comfortable alignment, which could easily put us on the defensive when it comes to issues around our closest relationships and our family ties. On the plus side, this square can help blast away any confusion and unworkable idealism, giving us patience and discipline to work through our issues. 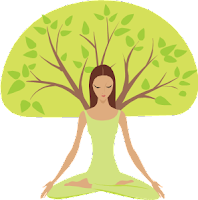 After Venus in Leo comes a much quieter energy. With Venus in Virgo, the affection is in the details, not in the grand gestures. You and your loved ones will now be able to take a step back from the drama of the last few weeks. Forget hearts and roses and consider the small things you do for each other that really show that you care. The husband who cooks dinner and clears up when you’re feeling tired, the friend who always calls when she says she will and the workmate who knows you’re having a bad day, but instead of making a big deal of it, simply brings you a coffee and a sympathetic smile. Venus is in Virgo until September 15. Quiet, hardworking, critical, modest, exacting, discriminating, dissecting, modest, humble, lacking in confidence are some of the common words and phrases used to describe Virgo. Not very exciting is it? Why not? Perhaps it’s because it comes right after Leo in the Zodiac. Any sign would seem humble after Leo, would it not? Little Bobby Leo, as he kicks the ball straight through the goal posts: Yes!!!! I’m ace!!!! The best!!!! I’m gonna be the next Beckham or Ronaldo!!!! Little Jimmy Virgo, carefully lining up his ball for his shot: Quiet Bobby, I’m trying to concentrate. He shoots, the ball goes in. Hey, I’m getting good at this, a bit more practice and I might make the school team. Humble? Not really. Realistic, hardworking, practical, yes! You see, Virgo is an Earth sign. Earth signs say it like it is, they say I am what I am, and just like their other Earth cousins, Taurus and Capricorn and they just get on with it, without any of that Leo hubris or drama. Perhaps part of the reason for Virgo’s bad press is that it rules the 6th house of the zodiac. The 6th house, traditionally, is malefic (‘bad’). It is the house of service, toil, chores, servants, subordinates, of small and humble things. It is also the house of illness and infirmity. Doesn’t sound like much fun does it? Of all the concepts from the above list, I think the only one that Virgo should own and embrace is service. Service does not have to mean subordination. After all, when you strip away the power and the ego, what are our politicians and spiritual leaders if they are not servants? Of course, we have to hope that they are servants to a higher cause, for the greater good, but seen this way, there is nothing humble about it. It is a huge responsibility, a responsibility worthy of any Virgo. However, Virgo, like the other Mutable signs (Gemini, Sagittarius and Pisces) must beware of spreading themselves too thin, scattering their energies and splintering off in too many directions. On the world stage, it's finally time for the Pluto in Virgo* generation (Barack Obama and UK PM in waiting, David Cameron – note: David Cameron is now the UK PM) to take the reins from the Pluto in Leo* bunch (George W Bush, Bill Clinton, Tony Blair, Gordon Brown) and clean up the messes they have made, ready for future, fair and just, Pluto in Libra* leaders. So for now, if you have Sun in Virgo (or otherwise have strong Virgo in your horoscope) you're in very good company. Stand up, borrow a little bit of that Leo pride, courage and confidence and get busy. You are wonderful and the world needs you! *The Pluto in Leo generation was born between 1938 and 1956. The Pluto in Virgo generation was born between 1957 and 1971 and the Pluto in Libra generation between 1972 and 1984. The start and end dates are approximate because Pluto tends to go back and forth before it settles into a new sign. Sun in Virgo until September 23. Mercury turns around at 19 degrees of Leo. Did you use the Mercury Retrograde period wisely? Even though it’s out of Retrograde it will still be in the shadow of its retrograde - going forward through the zodiac degrees it previously went backwards through - until September 10, so some of Mercury Retrograde’s themes and issues could drag on until then. Mercury turned Retrograde in Virgo on August 2/3. It re-entered Leo on August 7/8. It turns direct on August 26 and re-enters Virgo on September 8/9 where it stays until September 25. A Virgo New Moon is a good time to consider what and whom we serve. Is it, or they, worthy of our time and our energy? Is what we do for others healthy for everyone or is it a one-sided arrangement? Are we respecting the boundaries of those who serve us? This New Moon, at five degrees of Virgo, makes a Grand Trine with Jupiter in Taurus and Pluto in Capricorn, making this a fortuitous lunation for dealing with practical matters, reviewing routines and kicking any unhealthy habits. Jupiter, the planet of growth and reward, has been in earthy, sensual, materialistic Taurus since early June and now turns Retrograde, signaling a time to review what we have learnt and discovered over the last couple of months. Usually, Jupiter is about outward growth, where we seek to be rewarded out in the wide world. When retrograde though, Jupiter rewards inner growth and encourages us to contemplate and review our personal philosophy, beliefs and ethics. In Taurus, we are invited to consider our relationship to the physical world, nature and sensuality. We are asked to look deeply into our attitude to wealth, money and luxury. Is our need for comfort and sensation making us wasteful and over-materialistic? Is our over-consumption showing on our bodies? Would a simpler existence be healthier for ourselves and our environment? How will it help us spiritually to look for a new perspective on what we think we need and want out of life? Jupiter entered Taurus in June 4, 2011. It turns retrograde at 10 degrees of Taurus on August 30. It turns direct on December 26 at one degree of Taurus and remains in Taurus until June 2012. August 30: Jupiter in Taurus retrograde. Police helicopters? The wail of Sirens? Just another Saturday night in North London I thought, as I rolled over in bed to enjoy a peaceful night’s sleep. On Sunday morning I woke to the shocking news that just a mile away, in Tottenham High Road, a protest against the police shooting of Mark Duggan had spiraled into violence, arson and looting. With a sense of shock, I watched the footage on TV. 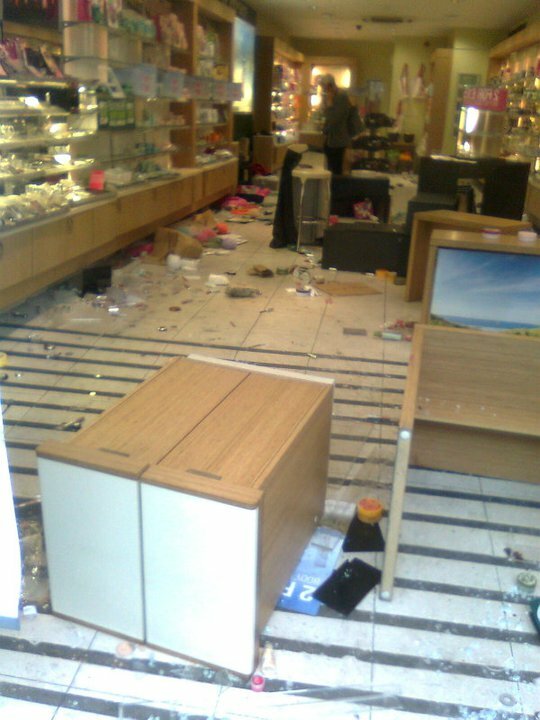 Around lunchtime, I headed up to the nearby Wood Green shopping centre, to pick up a paper and browse the clothing stores, unaware that while police were trying to contain the riots a mile away, local thugs had looted and vandalized the area. Some of the photos of what I saw illustrate this post. My overwhelming feeling was deep upset at the mindless, pointless destruction of my neighborhood. As you have most likely heard, the violence quickly spread across the capital, peaking on Monday in the worst night of disorder in London in living memory. 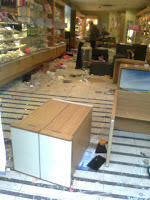 Meanwhile, there was rioting and looting in other English towns and cities, carrying on through Tuesday evening. ‘Why’ is the question on everyone’s lips. Based on UK riots in the eighties, the recipe seems to be: a spell of hot sticky weather + plus real or perceived injustice at the hands of the police (usually a death) + a background of recession/joblessness/government cuts + a Tory government. While there may be reasons, however, there can be no excuses for the actions of the kids who went out onto the streets causing terror within communities. Because I’m an astrologer, my natural reaction is to check the skies for planetary alignments that reflect events playing out in the world. The astrological backdrop is the square alignment of Uranus in Aries and Pluto in Capricorn. The themes of this alignment include rebellious impulses; reckless, hot-headed behavior; sudden and shocking events; anti-establishment feelings; the demand for freedom and respect; issues of control and responsibility; spontaneous uprisings; collective and individual crisis on any level. A serious questioning of power structures and authority is indicated. The call is for deep and radical changes in the structure of society and the way it is governed. By force, if necessary. In short, we are looking at a potentially protracted period of discontent, followed by/coinciding with, slow and profound social and political change. Past alignments of Uranus and Pluto coincided with the French Revolution of the 18th Century and the cultural revolution of the 1960’s which saw mass anti war protests; great strides in the women’s and black civil rights movements and increased social and sexual freedoms. It’s not all bad, Uranus-Pluto alignments are also associated with exciting times of cultural and technological innovation; social empowerment; positivity and freedom and new, progressive leaders rising from the grass roots and/or the intelligentsia. Under this alignment, we are already seeing pro-democracy uprisings in Egypt, Tunisia, Libya, Syria and many other places, a series of events widely dubbed the Arab Spring. With such dramatic events as we have been witnessing in the UK, we need to look for a planetary trigger? 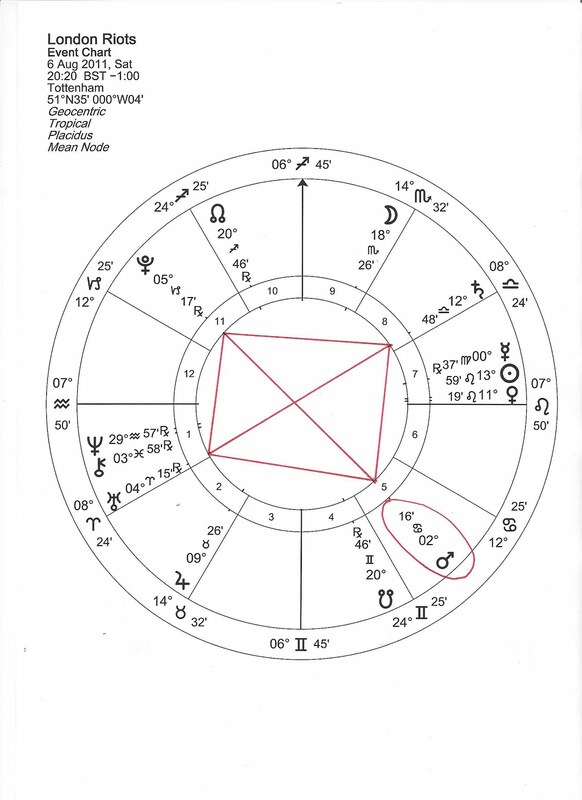 What is connecting to Uranus-Pluto that might symbolize what’s been happening? Above is the chart set for the time widely quoted as the start of the violence on Saturday evening. Mars, newly in Cancer had moved into alignment with Saturn, Uranus and Pluto forming a Cardinal Grand Cross. Just the shape of the cross in the chart suggests a back and forth ping-pong of intense energy. In cardinal signs, this energy tends to be fast to respond, quick to react and create friction. Lately though, a Cardinal Grand Cross happens every time a fast moving planet hits the early degrees of Cancer. The Sun has recently been there, so has Mercury and Venus. The Moon hits those degrees once a month. So why would Mars trigger this violence? Well, Mars is the planet of war and aggression, of the urge to action, of angry young men. More significantly, in Cancer, Mars is said be in its ‘Fall’, in the sign it finds most difficult to inhabit, making it more difficult for individuals and the collective to assert themselves in a healthy and positive way. Mars lining up with Saturn, Uranus and Pluto is not a recipe for peace and calm, but for blow-ups, misdirected anger and aggression. In collective astrology, Cancer is associated with our domestic situation, our home turf. It is perhaps ironic that after years of collective paranoia about foreign terrorists (symbolized by Pluto’s tenancy in Sagittarius until 2008) the destruction has come from our home grown young people, crapping on their own doorstep, if you’ll excuse my vernacular. Astrologer Theodore White told me that Mars is currently Out of Bounds. I won’t go into a technical explanation of Out of Bounds (you can Google it), but symbolically, it means that Mars is wild, out of control, it has free reign to do what ever it wants to do, outside the normal bounds of behavior. Folks I’m not making this up! Notice also the South Node. It’s in House 4 at the bottom part of the chart. House 4 symbolizes our home turf, our roots and the past. Similarly, the South Node represents past patterns that we fall back into. Astrologer Martin Davis adroitly observed that this placement of South Node, symbolizes the revisiting of past hurts, referring to the 1985 Tottenham riots, also triggered by tension between the local community and the police. The fact that at that time Uranus and Pluto were in a tense semi-square alignment, aptly demonstrates how the cycle of these collective events synchronizes with the cyclical nature of the planetary alignments. I could go into more detail and look at more of the astrology, but I think that’s enough. The title of this post is Why I still Love London. Here are my reasons. 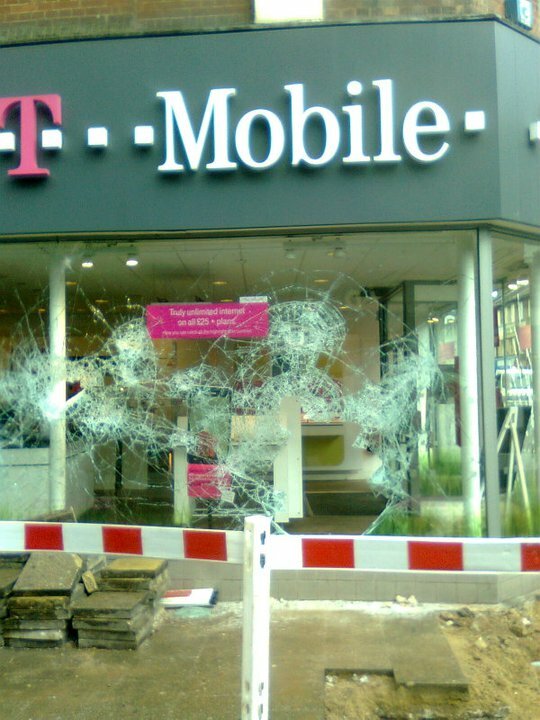 London is one of the safest capital cities in the world. I have never (except for a few nights this week) felt afraid to go out after dark. We are a resilient people. As the troubles spread, so did the community spirit. While social networking was blamed for making coordination amongst the rioters easy, soon it was being used to bring people together. 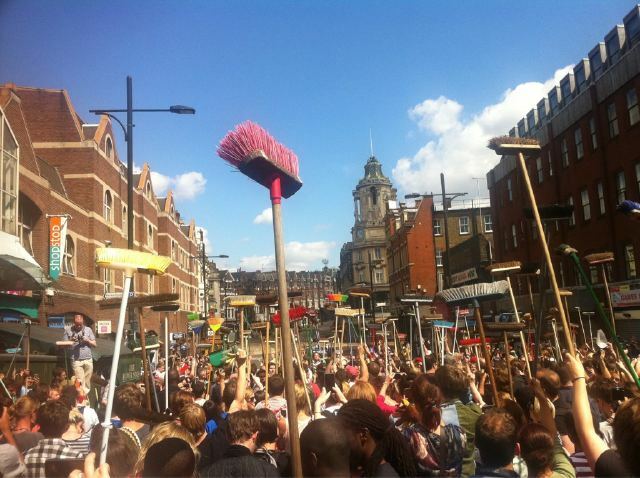 Instead of coming out onto the streets with weapons and face masks, people came out in force with bin liners and brooms to collectively clean up their streets. A fitting image for a Retrograde Mercury just moving out of helpful, hygienic Virgo back into brave, proud Leo. Let’s clean up and re-claim our streets was the new battle cry! Instead of thinking that it’s someone else’s problem or responsibility, people put up strangers in their own homes after they had lost everything to arson and looting. Bus drivers carried on working, despite the dangers (and despite Mercury retrograde!) to make sure that Londoners could get to work. There has been a massive wave of compassion for the injured Malaysian student Mohd Asyraf Haziq robbed by youths pretending that they were helping him. A Twitter campaign, #dosomethingniceforasyraf, is raising money to help his family fly over to visit him in hospital. The positive side of Mars in Cancer has come out. Pauline Pearce, a Hackney woman was filmed bravely taking on the riotiers and expressing her disgust over what was going on in her neighborhood. Her actions demonstrate that sometimes anger is justified if used positively (click on her name to see the remarkable video if you haven't already). As the days went by, more and more ordinary people were out on the streets protecting their own communities and businesses, taking collective responsibility. 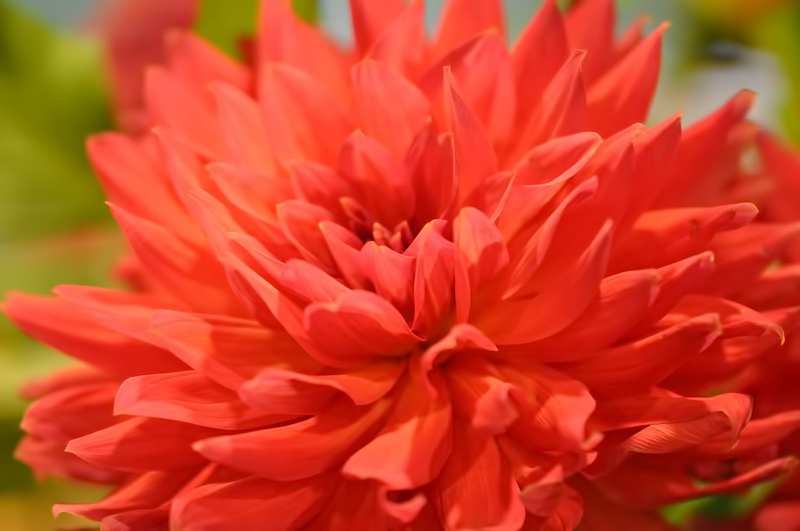 As Mars moved closer to its exact opposition with Pluto (an alignment associated with deep rage and violence), we also saw the positive side of this opposition. The holidaying politicians finally came home and all police leave was cancelled. Mass deployment of officers the likes of which I have never seen, seem to have restored calm. Mars of course symbolizes the police and with Pluto in Capricorn, the force and authority of the police. I would like to salute their tireless hard work. More generally, Londoners are friendlier, more considerate. They are talking to each other on buses and in shops, asking after each other. There’s a feeling of pulling together, of business as usual, of not letting this beat us. There’s even an anti-riot tea movement. (FYI, it’s about staying home and drinking tea and nothing to do with the tea party movement in the US.) It’s started selling tea to raise funds to help victims of the riots. Now that’s the London - the Britain - I know and love. As a P.S. 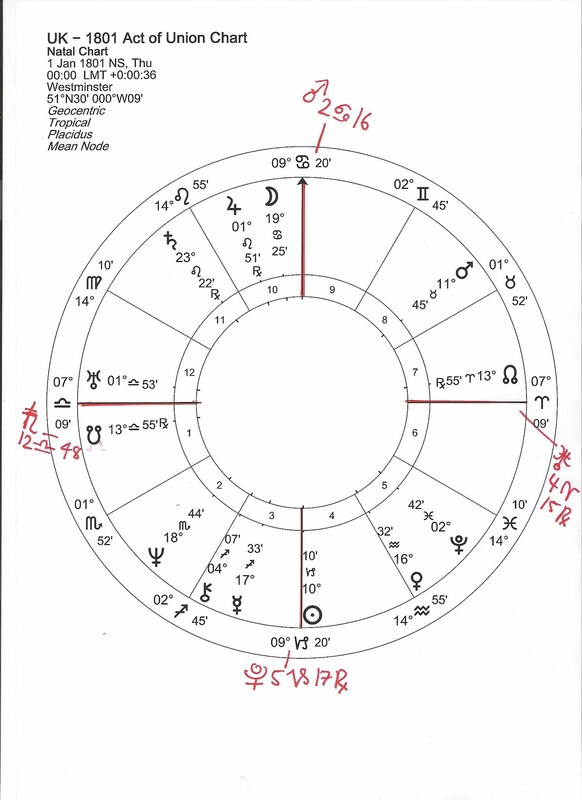 here’s a brief look at the UK chart, with the relevant transits of the riot chart drawn in. 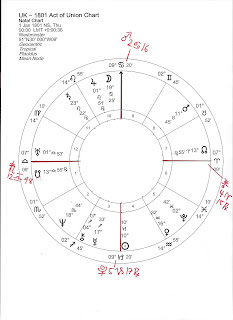 Note how close the Cardinal Grand Cross is to the angles of the chart (marked in red). Indeed, as the Uranus-Pluto squares become exact, it falls very close indeed to the angles of the UK chart. This is the just the start for the UK. I am not a doom and gloom astrologer and not given to making predictions, but one thing is for sure, we now need to begin the process of restructuring our society and moving forward with the profound social and political changes that accompany significant Uranus-Pluto alignments. We have now had too many warning signals to ignore – the banking crisis, the recession, bankrupt countries, stock market crashes, unemployment, not to mention numerous instances of abuse of power coming to light, which in the UK includes the MPs expenses scandal and the hacking scandal, which not only implicated the media, but exposed immoral, maybe illegal practices, within government and police institutions. 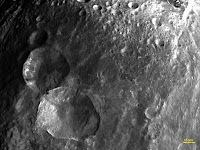 This week, NASA published some remarkable close up photos of the asteroid Vesta. It’s part of NASA’s Dawn Mission, which is orbiting in the asteroid belt between Mars and Jupiter. Next stop Ceres. Ceres and Vesta are what they call protoplanets and by studying them, the mission hopes to uncover new insights into the birth of our solar system. 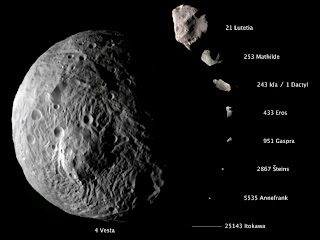 Both Ceres and Vesta are well known to astrologers. Along with Juno and Pallas Athena they are the Asteroid Goddesses, profoundly feminine energies amongst a group of planets that for the most part are named for the western masculine mythological tradition. Slowly though, the tables are turning, as new bodies are being named for female deities including Eris, after the Greek goddess of strife and discord and Sedna, in honor of the Inuit goddess of the sea. And now that Vesta and eventually Ceres are finally showing us their beautiful faces, close up and personal, what does this mean for the feminine? As an astrologer, I believe that what happens in the skies (whether naturally or by human intervention) is reflected in the collective. So yes, I do hope that the emerging prominence of these female named objects will be reflected in a rebalancing of the masculine and feminine energies of our world. Goddess knows we need it. Oh and I’m not necessarily speaking gender here, I’m thinking more in terms of our general values - intuition, caring, sensitivity, compassion, how we care for our lovely planet and for all the human beings and creatures that walk upon it. In Roman mythology, Vesta was the virgin goddess of the hearth, home and family. Her priestesses, known as the Vestal Virgins, were responsible for keeping the sacred flame alive, considered essential to the security and continuance of Rome. The Vestal Virgins took a strict vow of sexual chastity, but in return enjoyed status and privilege in Roman society. However, it is believed that earlier versions of Vesta’s priestesses (in pre-Hellenic Greece) participated in sacred sexual rites, said to symbolise the eternal sacred flame. Perhaps this is why Vesta has been associated with both the signs of Virgo (chastity/modesty/service) and Scorpio (passion/sexual energy/control). In astrology, Vesta symbolises the sacred flame, the divine spark we carry within. In our birth chart, Vesta – by sign, house and aspect - symbolises whatever gives us a fire in our belly, our raw ambitions. She also speaks of the service and devotion we must apply to our passions in order to keep them alive and use them to create something useful and secure. So sexual energy, dedicated service and fiery devotion are all good key phrases for Vesta. Overall, I think Vesta symbolises that little part of ourselves that we must own and not give away, our spirit. She also, I intuit, has something to say about how we feel about our home and family and in particular symbolises the family rituals and habits that tend to become ‘sacred’ within family groups. You can find out Vesta’s zodiac position for today, or any given date, at http://www.serennu.com/. Serennu also lists the positions of other asteroids, centaurs, fixed stars and trans-neptunian objects. If you do a google search you will quickly and easily find some basic interpretations for your Vesta by sign and house, but why not DIY. Simply scribble down some key phrases for Vesta with the key phrases for the sign and house and then do a bit of word play…. For example here are a few quickly put together ideas for Vesta in Cancer in the Second House. August’s astro-preview is split into two parts. A summary list of all August’s events is included at the end of each post. Click to read part two. August begins off the back of a Leo New Moon on July 30. 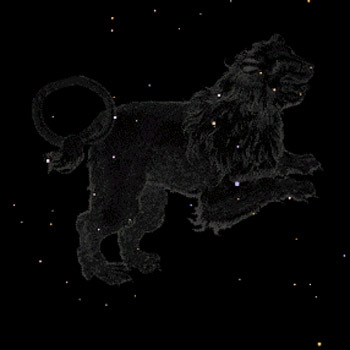 The Sun remains in Leo until August 23. Here are some quotes from some very well known Leos Mick Jagger’s is my particular favorite. This classic song sums up the month of Leo for me: Those Lazy, Hazy, Crazy Days of Summer by Nat King Cole, a legend clearly named after his Saturn and Neptune in Leo. Mercury has been in Virgo since July 28, urging us to think logically, critically, analytically and to use our words, minds and hands to be helpful. On August 2 or 3rd (depending on your time zone), the trickster planet turns retrograde. While we’ve come to expect glitches in communication, travel and technology while Mercury is retrograde, there’s no need be fearful. The world won’t stop, just remember that the devil is in the detail, so check, double check and re-check all arrangements now. It’s also a good time to review and reorganize old information. For example, I am planning to create an easy to use database of all my blog posts and articles, a perfect activity for a backward facing Mercury in Virgo. On August 7/8 Mercury rolls back into Leo. Expect the themes and dramas of July to revisit us - dramatic communication, creative flair. At worst, stubbornness or childish tantrums. At best, humor, warmth, affection and heart. And boy was July dramatic. In my preview of July's astrology, published on July 1, I predicted "stories about attention seeking big heads, dramatic announcements and heroic tales of courage while Mercury is in Leo. Kings, Queens and leaders could all be in the spotlight now". So what happened? Well, it was on July 4 that the News of the World phone hacking scandal finally blew up, after the revelation that the phone of murdered schoolgirl Milly Dowler had been hacked. A number of high profile leaders resigned their posts and the paper was shut down. With Mercury retrograde, expect new evidence and more raking over old ground in this story. Where were the heroes? MP Tom Watson, who played a key role in bringing the scandal out into the open was one, along with the Guardian newspaper's reporting throughout. Attention seeking behavior included wannabe comic Jonnie Marbles throwing a foam pie at Rupert Murdoch at the parliamentary committee hearing. Also the horrific killing spree of Norwegian fascist Anders Behring Breivik. These men believed that they were doing something heroic, although any decent minded person would disagree with that analysis, especially in the case of Breivik. 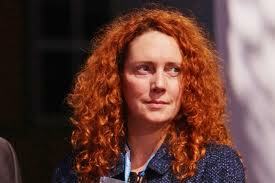 Finally, one of the key images of the scandal was the voluminous flame hair of Rebekah Brooks. Very Leo! Mercury will turn Retrograde in Virgo on August 2/3. It re-enters Leo on August 7/8. It turns direct on August 26 and re-enters Virgo on September 8/9 where it stays until September 25. 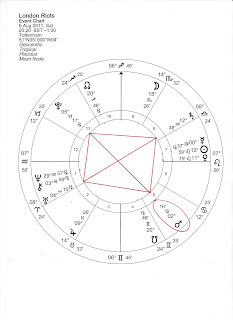 Protection and security are primary concerns of Mars in Cancer, so actions tend to be influenced by those issues when Mars is in the sign of the crab. Cancer is also very intuitive, so having Mars here sees more of us acting on our hunches. The danger is that Mars in Cancer encourages hypersensitivity and over reaction. Take a deep breath before going on the defensive now. The sensitive side of Mars in Cancer is bound to come out when, on August 3, it trines Neptune in Pisces. Acting with compassion and empathy is well starred. Cancer might be an emotional watery sign, but it is also a dynamic cardinal sign. Its get up and go energy can be unstoppable when activated. I would certainly want someone with Mars in Cancer to protect me if I was in trouble! Moving into a cardinal sign means that Mars will be very active during August, forming dynamic aspects with Uranus and Pluto on August 9/10 and Saturn on August 25. Be prepared for challenges to present themselves on or around those dates and don’t be shocked if around the 9–10th there’s rebellious feeling in the air. To make the most out of that energy, try to use it with creativity, positivity and compassion. Mars is in Cancer until September 19. Neptune tipped his trident into watery Pisces on April 4, after 14 years in airy Aquarius. Neptune in Pisces invites us – individually and collectively – to explore things like compassion, empathy, philanthropy, suffering, idealism, spirituality and sacrifice. Before settling into Pisces though, he takes one final flight back into Aquarius. The next few months are a time to contemplate those Neptune in Pisces themes and think about how you can spread the word and make them work for the good of all humanity (Aquarius). Neptune retrogrades back into Aquarius on August 5, re-entering Pisces on February 3, 2012, after which it will stay in Pisces until 2026. I love Full Moon times there is so much energy in the air. Sometimes it’s good, fun energy and sometimes the energy is a little crazy as things come to a head and pop. What’s best about a Full Moon I think, apart from the fact that it’s a beautiful astronomical event, is that it highlights the common issues of the two opposing signs the Sun and Moon fall in. Now we are drawn to pay homage to the Leo-Aquarius axis (or continuum, as astrology Joyce Mason so aptly expresses it). Together, Leo and Aquarius symbolize the urge to balance the individual need for personal gain and acclaim with the collective responsibility to abide by rules set to benefit all of society (and if you think rules are not very Aquarian, pause to remember that Aquarius’ ancient ruler is none other than stern father Saturn). Aquarius will never deny Leo’s right to be king, but will absolutely insist that the king serves his people with integrity and honesty. Teamwork and delegation of authority is everything to Aquarius and selfish greed is just not acceptable. Aquarius teaches that it is through serving the group, the community, the team, our friends, that we gain the honor and significance that is so crucial to Leo. Conversely, Leo teaches Aquarius that sometimes you have to take the lead if the cause is important enough. Somebody has to stand up for the masses, rebel against the status quo and shake the system up, if there is to be any chance of a lasting change for the better and what better than Aquarian energy to do this! On a personal level, look for help from the groups you belong to (your community, your team, your friendship circle etc) during this Full Moon for clues about what might need to be addressed or released in your life right now, then seize your power, remembering to act in a way that will benefit your community, whilst still honoring your own unique, highly individual needs. Most of all - have some fun. Happy Full Moon. NOTE: *Where two dates are given, the event occurs on the earlier date in American time zones and on the later date in European time zones. This is due only to time differences on the clock, in reality the event occurs simultaneously everywhere.